Indianapolis, IN: Moving doesn’t have to be a disorganized nightmare, wasteful to the environment or expensive any longer, thanks to Bin It. Bin It recently announced the launch of their Indy franchise providing “for rent” eco-friendly moving bins they deliver then pick up after your move. Most people have felt what it’s like to move in a less than organized way, without the right moving supplies or planning in place. This can certainly be a wildly draining headache causing untold amounts of stress. Fortunately, Bin It can help. Bin It, who recently announced the launch of their Indy franchise, rents high quality eco-friendly bins for moving. The company even picks up the empty bins after you finished unpacking at your new home. Bin It is a unique bin and moving box service that offers two unique, but highly compatible, services to the New York City, Philadelphia, Nashville, and now Indianapolis areas. With Bin It, you simply order temporary bins and they are delivered in a convenient stack to your home. 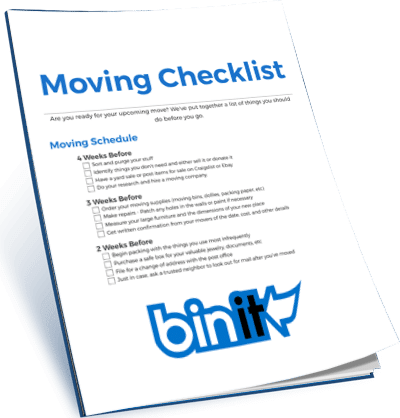 The moving boxes from Bin It are made out of sturdy, durable plastic that can store all of your things, from clothes and shoes to toys, makeup, kitchen appliances, dinnerware, and everything in between. When you move into your new space and unpack, Bin It will pick up all the empty bins from your home so you are box and clutter free.